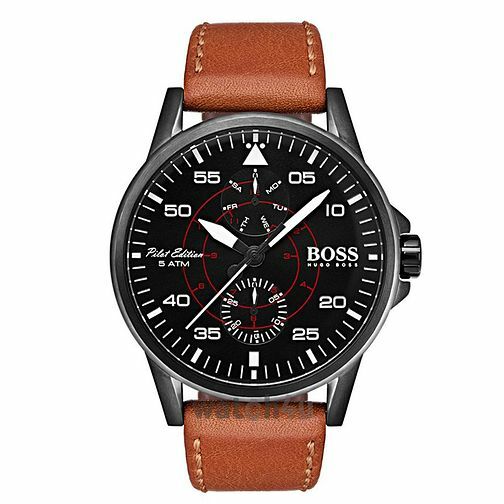 Hugo Boss presents the Aviator men's timepiece, crafted with a 44mm grey IP case, boasting a bold black dial. Day and date sub-dial displays are positioned at the 12 and 6-o-clock positions. The traditional hour markers displayed within the centre of the face in red and the corresponding minutes displayed in bolder white around the outer with a minute tracker circling. Finished with a brown leather strap with buckle closure, this swiss-made watch boasts water resistancy up-to 50 metres.